EUGENE, Oregon — The 2016 NCAA Division I Outdoor Track & Field Championships kicked off Wednesday afternoon as the men took center stage at Hayward Field. While temperatures cooled significantly from the upper 90s that scorched the previous three days, the action heated up on the track and in the field. Six individual champions were crowned (hammer throw, pole vault, long jump, shot put and 10000 meters), many others reserved their spots in Friday’s finals and even more saw their seasons end early. Let’s look back at Day 1 with some of the biggest storylines. The top-ranked Aggies entered NCAAs tied with Oregon for the second most chances to score (17). When competition wrapped up Wednesday night, Texas A&M only had three qualifiers for Friday’s track finals. Donavan Brazier earned the top seed in the 800, Robert Grant posted the second fastest time in the 400 hurdles and the 4×400 team qualified seventh. Unlike three other programs from the SEC, the Aggies won’t have an athlete in the 400 final. Nor will Texas A&M join three conference rivals in the 4×100 after DNFing the semifinals. The Aggies also had three scoring opportunities in the pole vault, yet two no heights and a 12th place finish ruined those dreams. Texas A&M is now on the outside looking in when it comes to the national title picture. Don’t count the Aggies out, but just know it’s going to take a miraculous effort to bring the crown back to College Station. We mentioned on Tuesday that Arkansas senior Jarrion Lawson would be a busy man at NCAAs. As it turns out, Lawson handles hectic pretty well. Lawson won the long jump title, qualified in the 100 and 200, and helped the Razorbacks run the day’s best time in the 4×100 (38.71). Let’s put this into perspective: Lawson competed four times in the span of two hours. At one point he went from warming up in the long jump to punching his ticket to the 100-meter final and then later, left the competition in the long jump to run the day’s fourth best time in the 200 (20.28). It seemed as if fatigue caught up with Lawson between the 100 and long jump, but he shook off two fouls to post two leaps of 8.13 meters or better, including the winning mark of 8.15m (26-9). If Lawson places where he’s seeded on Friday, he would score 23.5 points for Arkansas at these championships. What do you get when you cross the second fastest American junior outdoors with the third fastest man in collegiate history outdoors and throw in a bunch of other guys with wheels? A recipe for fireworks. Donavan Brazier and Brandon McBride will be joined by Shaquille Walker, Eliud Rutto, Isaiah Harris, Robert Heppenstall, Sampson Laari and Chris Sanders in what could be the fastest 800-meter final in meet history. The quickest time run by an 8th place finisher at NCAAs was 1:46.80 (Peter Etoot, Alabama). The slowest PR of an athlete in the field is Heppenstall’s 1:46.92. This will also be the first time since 2004 that there will be three freshmen in the final (Brazier, Harris and Heppenstall). Here’s another interesting note: Brazier’s 1:45.07 was the fastest qualifying time in meet history, besting the old mark of 1:45.54 set by Robbie Andrews in 2010. 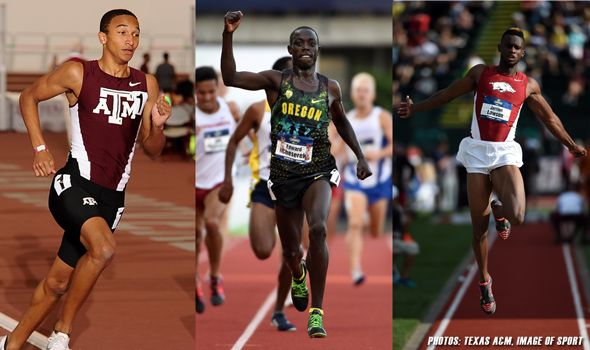 Here’s how the 10 men on The Bowerman Watch List did on Wednesday. Oregon’s Devon Allen — Qualified first in 110 hurdles (13.38), failed to qualify in the 200. TCU’s Ronnie Baker — Indoor 60-meter champ failed to qualify in the 100, but will run in the 4×100 final. Baker’s time of 10.09 in the 100 is tied for the fastest mark to not make the final in meet history. Oregon’s Edward Cheserek — Became the third man in collegiate history to win three 10000-meter titles. His time of 29:09.57 was just one of two winning times since 2005 slower than 29 minutes. Arkansas’ Jarrion Lawson — See above. Pennsylvania’s Sam Mattis — Did not compete. Mississippi State’s Brandon McBride — See above. Oklahoma State’s Nick Miller — Won hammer throw with a heave of 73.98m (242-8). LSU’s Nethaneel Mitchell-Blake — Fastest 200 qualifier (20.17), second fastest 100 qualifier (10.09) and anchored second fastest 4×100 relay team. Texas A&M’s Lindon Victor — Currently second place in the decathlon with 4308 points. Washington’s Izaic Yorks — Qualified third in the 1500 (3:40.87).